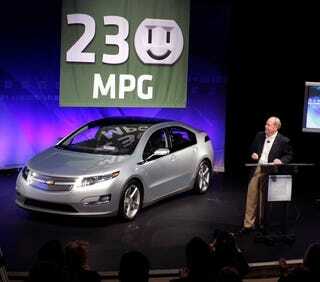 POLL: What The Hybrid Is The Chevy Volt? On today's Chevy Volt drive, our Justin Hyde has learned there are situations where the Chevy Volt's premium gasoline-fueled engine kicks in to motivate the wheels at speeds as low as 30 MPH. What then, does that make the Volt? We've just learned that even Motor Trend might not have gotten the full story on the Chevy Volt's mechanical motivation. Apparently, according to engineers Justin's speaking with today during his first drive of the Volt, there are situations where the engine actually motivates the wheels at speeds above 30 MPH. That's right, it's not just when the battery is drained at speeds in excess of 70 MPH, as we were originally told. Of course that was after were originally originally told it would never motivate the wheels ever. All this is making us wonder — what should the Chevy Volt be classified as? We're working with our friends at Changing Gears and TrueCar to find out what you think we should call it with the following poll.